62445301681 ;jsessionid=10179dmc7j7ma0in916vhz15f5yrif.10179?wicket:interface=:0:beta-club:modal-container:modal-content:content:body:login-rixty-form:visibilityContainer:fbconnect::IActivePageBehaviorListener:1:&wicket:ignoreIfNotActive=true It seems like your browser is preventing Facebook Authentication. This happens when your browser's Tracking Protection is enabled. To continue logging in via Facebook, please turn off Tracking Protection or use a different browser. 62445301681 ;jsessionid=10179dmc7j7ma0in916vhz15f5yrif.10179?wicket:interface=:0:login-panel-small:login-small:login:modal-container:modal-content:content:body:login-rixty-form:visibilityContainer:fbconnect::IActivePageBehaviorListener:1:&wicket:ignoreIfNotActive=true It seems like your browser is preventing Facebook Authentication. This happens when your browser's Tracking Protection is enabled. To continue logging in via Facebook, please turn off Tracking Protection or use a different browser. 62445301681 ;jsessionid=10179dmc7j7ma0in916vhz15f5yrif.10179?wicket:interface=:0:login-panel-small:login-small:signup:modal-container:modal-content:content:signup-form:fbconnect::IActivePageBehaviorListener:1:&wicket:ignoreIfNotActive=true It seems like your browser is preventing Facebook Authentication. This happens when your browser's Tracking Protection is enabled. To continue logging in via Facebook, please turn off Tracking Protection or use a different browser. 62445301681 ;jsessionid=10179dmc7j7ma0in916vhz15f5yrif.10179?wicket:interface=:0:redeemcode:modal-container:modal-content:content:body:login-rixty-form:visibilityContainer:fbconnect::IActivePageBehaviorListener:1:&wicket:ignoreIfNotActive=true It seems like your browser is preventing Facebook Authentication. This happens when your browser's Tracking Protection is enabled. To continue logging in via Facebook, please turn off Tracking Protection or use a different browser. What happened to my Rixty Reward Points? Why don't I see my full Rixty account balance? How do I buy ROBUX or Builders Club at ROBLOX? Why didn't I receive free items after spending a Rixty Card? 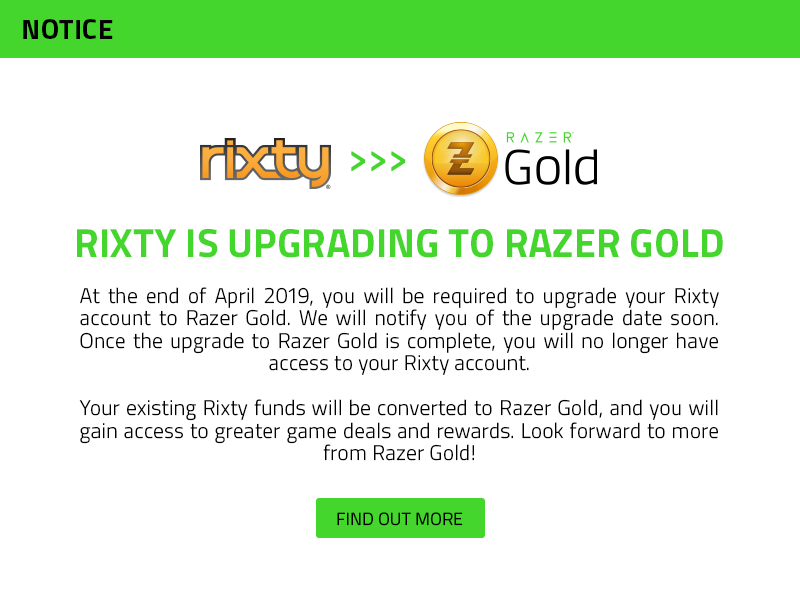 How can I transfer my funds to Razer Gold? How can I top up with PayPal? Where is my nearest retail top-up store location? Where can I find the Rixty payment option inside my game? Where can I buy or earn Rixty codes online? Input a TransactionID, PaymentID or LoadID to search. Look for the TransactionID, PaymentID or LoadID in the email you received from Rixty ([email protected]) when you began your purchase. This ID does NOT come from the game. Click here to submit a support request in English. Clique aqui para solicitar atendimento em Português.